I am writing to tell you about how I fell in love today. 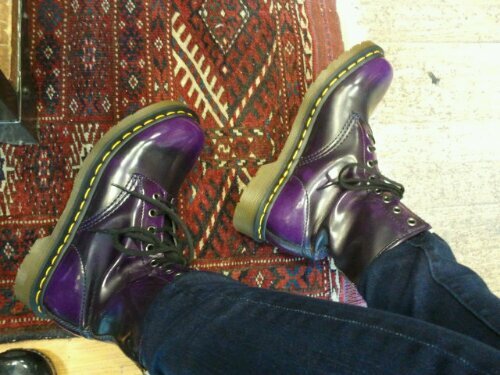 Sure, I had seen that Dr. Marten’s had added PURPLE to their line of black and cherry red vegan docs, sure. I had sort of flipped out about it mostly quietly. I shared the links and filed it away in my head. Then this week I saw that they had come out with some absolutely adorable vegan T-straps that reminded me very much of the mary janes I had in high school. I mean, I did get a little frantic with want, I’m not going to lie. Then today… I did it. 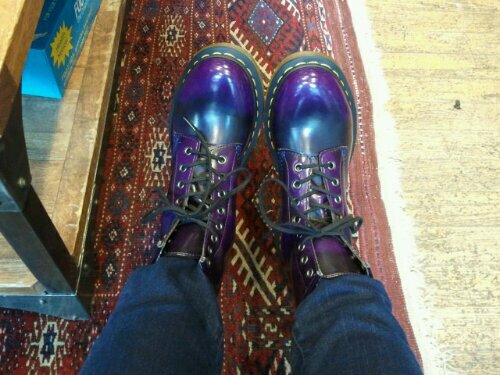 I went to the Dr. Martens store in downtown Seattle. That’s when I casually asked about the purple. Apparently, they had them in the back! They hadn’t even put them out yet. She brought me the box of boots and pulled them out, and I may have shrieked with joy. These are the most gorgeous shoes I have put on my feet, ever. I’m a recovering shoe-aholic that has been clean for years, but these just sent me over the edge. I haven’t felt this way about shoes in a really long time. I had a really hard time taking them off. Just look at them! Also, they are incredibly comfortable for brand new docs. The material is nice and supple, and you could tell they wouldn’t do that horrible back of the heel thing new docs do. The girl had a different pair of the vegan ones on herself. She said they softened up even more & that she’d had her’s 8 months. I must have these shoes. They retail for $130, but you can get them on amazon for slightly cheaper, so that’s what I’m going to do. They also make the 3 hole oxford in this lovely burnished purple color, if you like it. The T straps come in black only at this time. I was going to hold out until landing my 2nd interview to buy the T-straps, and while I still will likely do that, I just don’t think I can wait for these boots. Besides the weather & walking here justify this purchase, don’t they? ← Thai 65 – Seattle’s University District & Seattle Update! I’ve had these purple boots for a year and a half or so and I am DEEPLY IN LOVE with them too! What a legacy I leave you guys! I did! They arrive on Friday! 🙂 at least i saved $12!